I want to expect to compete for a big ten championship and contend for the final four. In which case, a veteran player like Pierce should help. An experienced player who will grasp the offense, make open 3s(hopefully) and appropriately move the ball is exactly what next years team needs on the wing. Not to mention there is a non-zero chance that Wilson is a one and done. Michigan would have lost 6 or 7 starters in two seasons. That’s a Kentucky level blow without the incoming talent. With that said, it would be nice to add Beverly, Quinones or Franz to that depth chart. You’re right. And it probably wasn’t fair to leave out all/any incoming 2020 freshman. 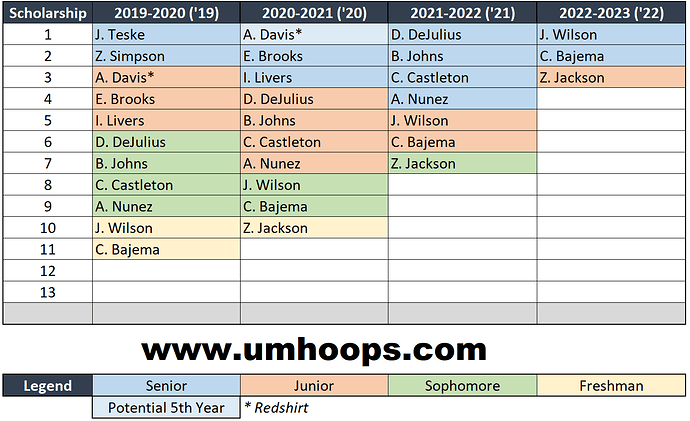 Of course, even adding freshman to that rotation, you aren’t looking at a roster than can maintain the standard that the 2018-2020 teams have and project to do. I think it depends on the specifics of each situation as far as what 2019 recruit, what grad transfer, etc. If you are taking a 2019 who you don’t think can crack the rotation, you probably could do better by targeting a 2020 kid IMO. On the other hand, it is fairly easy to see the 2020 class becoming a big group even if you sign another 2019 this year. It’s a little different than Matthews (because of testing the draft already) but do you expect Davis to be treated as a Senior this year? There’s precedent with it: Donnal was despite having a year left. IMO that is the most logical occurrence. Bring in whoever are the best players for next year. Yeah. DDJ and Caselton could end up being great, and both might have higher ceilings than their predecessors, but gotta get the most out of X and Teske’s last year. Who knows if we will field two senior defenders of that caliber, again. Even though I am on the executive board of the Austin Davis fan club, I expect next season to be treated as the big fella’s senior season. I’d love to be proven wrong, though. I still think he could have a role on this team but he’s gotta get those fouls/40 to under, say…40? Yes, I would assume so. Similar to Horford, Bielfeldt, Donnal, etc. Michigan has basically made it a point to treat redshirts in this fashion. For example, Davis was listed as a junior on last year’s roster. The other advantage of a grad transfer is that you know for certain that the spot will be open the next year, and can fill it whenever the opportunity arises, without having to worry about being oversigned.